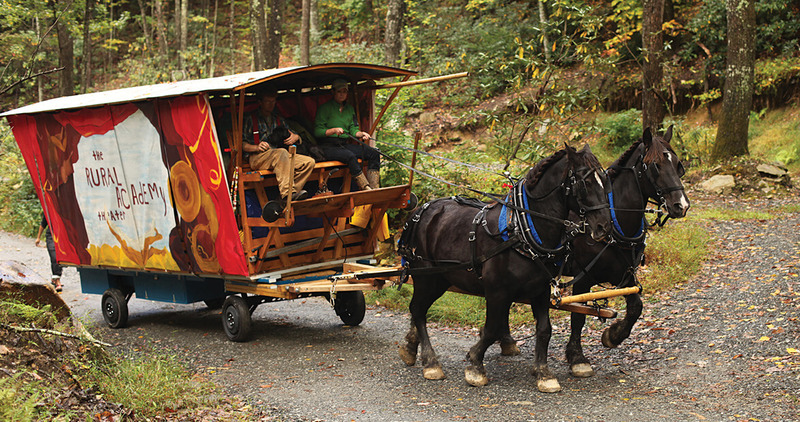 Why would a band of performers traverse western North Carolina in a wagon? Because in entertainment, delivery matters. A team of horses halts in a pasture in Black Mountain. As the red covered wagon behind them rolls to a stop, curtains flutter in the mountain breeze and shield a collection of costumes, hand-painted props, and puppets. The Rural Academy Theater has arrived. It’s been awhile since traveling at 2.5 miles per hour was considered progress –– especially for entertainment. In a culture of Netflix, Hulu, and YouTube, Rural Academy Theater founders, brothers Gabriel and Noah Harrell, are taking the slow road by driving a wagon around western North Carolina. It’s their third tour through the region, and they’re bringing with them a troupe of performers who hail from everywhere between Scotland and Seattle. In that pasture in Black Mountain, all eight performers dismount. Those who rode alongside the wagon rest their bikes against nearby trees. Others hop down from the wagon seats. The crew mills about, unloading supplies and prepping the stage. Lit only by lanterns and strings of lights in the grass, the show begins at sundown. An oversized toy and puppet stage is built into the side of the wagon, which alone is an impressive feat. The wagon is constructed of cypress from the Cape Fear River and was built by North Carolina wagon craftsmen to sustain the state’s humid weather and mountainous terrain on the theater’s journeys, which begin in September, in Lenoir, and end seven weeks later in Black Mountain. The opening segment is a work of clever storytelling, a whimsical show of puppets and colorful props. Next is a comedy sketch born of improvisation on the first day of rehearsals. Then the evening settles from comedy to melody. The cast reveals itself again, this time with accordions and brass instruments in hand. Their quirky concoction of Appalachian-Balkan-brass-klezmer-Dixieland-string music accompanies a silent movie playing from a projector. Then the show folds into itself — projector rolled up, puppets packed away, sideboards fastened for moving on — to a college campus, a small local green, or to pause along the riverbank at the edge of a rural North Carolina town. Arriving at the next destination may take a while, but that’s OK. This isn’t a show that’s valued for efficiency. It’s a diversion — worth making because it touches close to home. Performance times, admission prices, and locations vary. See website for details. Danchi was an editorial intern with Our State in the summer of 2014. She's a recent graduate of North Carolina State University.